Beatrix Potter’s talented pen created the world of Peter Rabbit, Mrs. Tiggy-winkle, Jeremy Fisher and their friends. That talent also opened doors for Beatrix—she was able to reach her dreams.Because of her passion for her work, she was able live a creative life—a life on her own terms. “Miss Potter” tells the story of a woman whose life was marked by incredible professional success and unimaginable personal grief—a woman who survived to become one of the world’s most successful children’s writers of all time. ©2006 Weinstein Co. All rights reserved. A beautiful an engaging film that effectively captures England and upper class society prior to World War I. The meticulous attention to detail of the period costumes and artifacts is second to none. 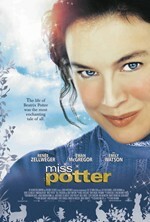 Renee Zellweger is outstanding in the role of Beatrix Potter. Adorable!but a bit 2 long.SEE IT!!!!!!!!!!!!!!!!!!!!!!!! I Really enjoyed this movie seen it 3 times already showing it to different friends. They also were quite surprised. Very charming you can just feel the excitement between the characters without even touching a far cry from todays youth!! !